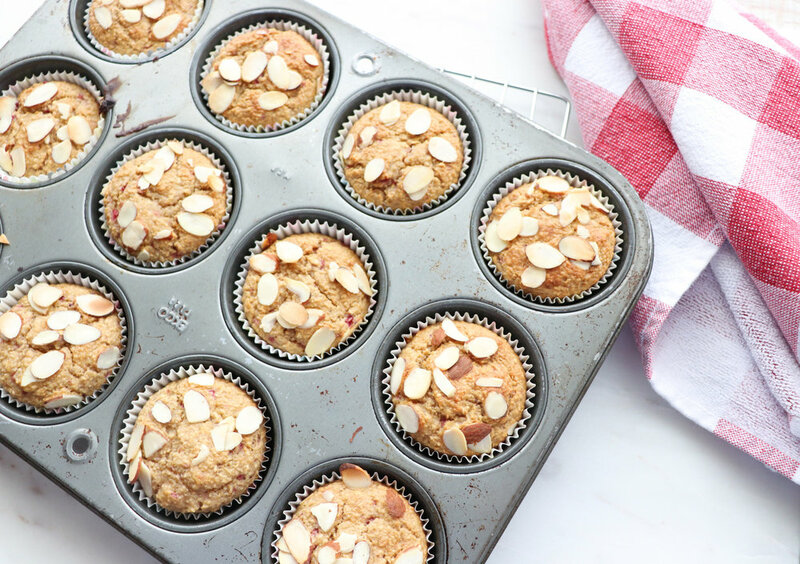 An easy muffin recipe that comes together in less than 30 minutes, start to finish! Muffins are one of my favorite breakfast foods/treats. But, let's face it - many aren't that healthy! This recipe is tasty, healthy and quick! You just put everything in a blender, pulse it a few times and it is ready to go in a muffin pan. Top with some sliced almonds for crunch, bake and bam! Fresh, warm muffins, ready to devour! 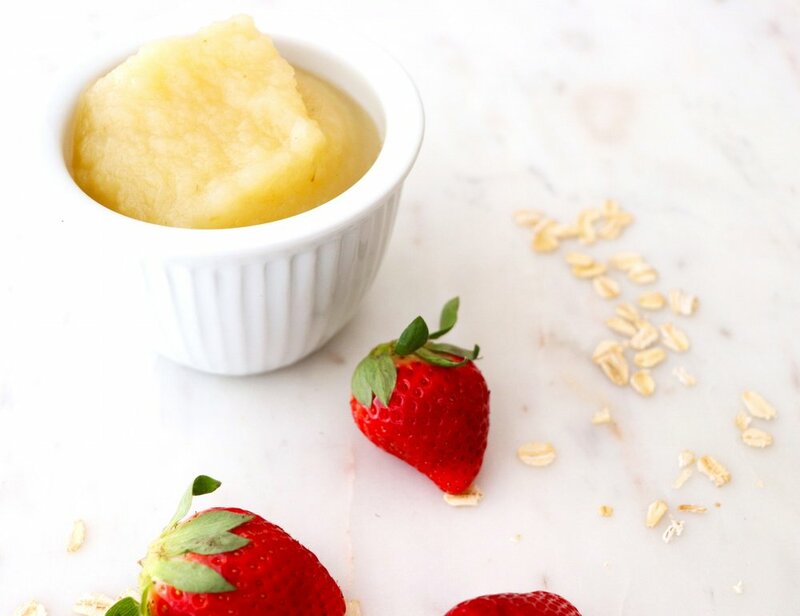 I've made this recipe using unsweetened applesauce and fresh strawberries as well as with Strawberry Chia Applesauce. Both turned out great! You can see a few more "pieces" of strawberries when using the separate ingredients but there is no difference in flavor. The recipe starts with regular (old-fashioned) oats. Process for a few seconds in the blender before adding the other ingredients. This results in a coarse oat "flour" so no regular flour is needed. Note: I made the version shown here with applesauce and strawberries and used paper liners. When I made it with the Strawberry Chia Applesauce I just sprayed the muffin tin with non-stick spray. The muffins were a little difficult to remove from the paper liners unless they had completely cooled so I would recommend just using a non-stick spray and no liners. PSA (public service announcement): Make sure your baking soda and powder have not expired! When first testing out this recipe I noticed my baking powder was rather cakey, and I was using the last little bit. The muffins didn't rise much at all. When I looked at the expiration I found it had expired about 5-6 months ago! (Here is a way to test if your baking soda and powder are still fresh). I made another batch with new baking powder and there was a significant improvement. Note to self: clean out spice cabinet and get rid of old spices, herbs, baking ingredients! Preheat oven to 400 degrees Fahrenheit. Spray a 12-cup muffin tin with non-stick cooking spray or line with cupcake liners (note: recommend spraying with cooking spray instead of liners). Place the oats in a blender and process for a few seconds or until resembles coarse meal (similar to cornmeal). Add the remaining ingredients except the sliced almonds and pulse several times until combined. 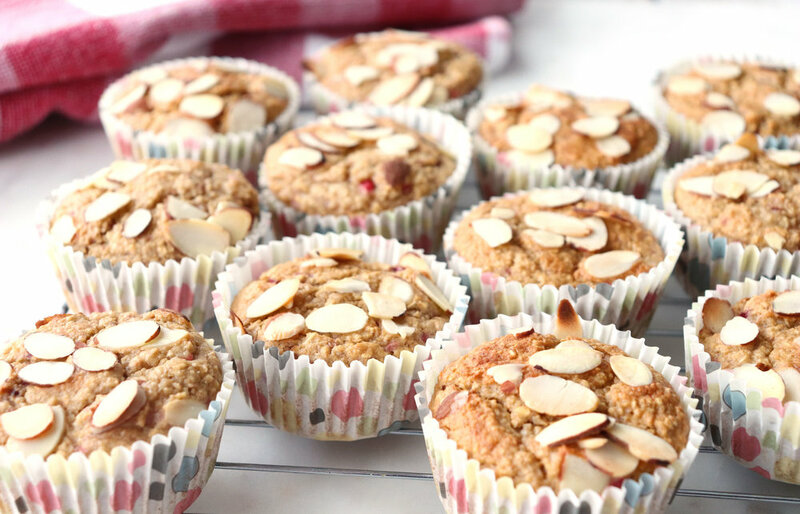 Pour into muffin tin and top with sliced almonds. Bake for 14-16 minutes or until toothpick inserted into muffin comes out clean. Cool in pan on cooking rack for 2 minutes then remove from muffin tin onto cooking rack. Cool completely.